So you have a car but not the one you want? Your current vehicle doesn’t match your lifestyle needs? 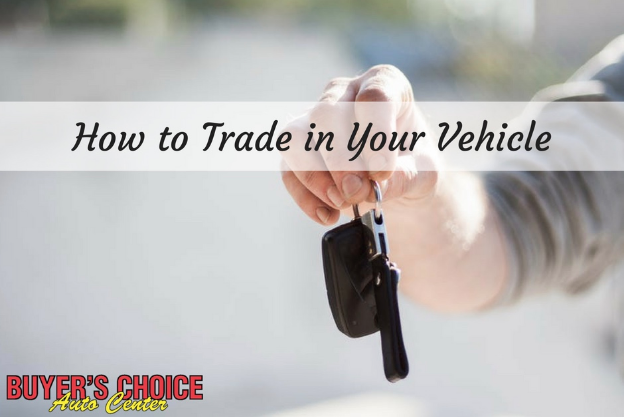 We at Buyer’s Choice know that trading in your car can seem like a daunting thing to do, but just follow these easy steps and you can be on your way to getting the car you really want! The first thing to do when looking to trade your vehicle is finding out what it’s worth. There are hundreds of ways and resources to do this. At Buyer’s Choice we make it easy and convenient to take this first step with our online trade value form. All you have to do is submit the details and information on your vehicle and we will let you know based on these factors what it’s worth. If you want to trade your vehicle you need to have your new car selected. Use our online inventory to search through our available vehicles. If you don’t see something your looking for, that’s okay. Just let us know what you’re looking for and we can find the vehicle quickly and have it brought here in just 3 days! Once you’ve assessed what your vehicle is worth and selected your new ride, all that’s left to do is close the deal. You can speak with one of our amazing and understanding staff to help you negotiate a fair price and finance your new vehicle. Be sure to ask us any questions you may have. Once all the paperwork is completed, you can join the ranks of our satisfied customers and drive off the lot in the vehicle that is truly right for you! Are you ready to trade in your car? Give us a call at 843-225-7044 , visit us online or stop in and see us at 902 N Main Street in Downtown Summerville.